The Periodic Table does more than just list the elements. The word periodic means that in each row, or period, there is a pattern of characteristics in the elements. This is because the elements are listed in part by their electron configuration. The Alkali metals and Alkaline earth metals have one and two valence electrons (electrons in the outer shell) respectively. These elements lose electrons to form bonds easily, and are thus very reactive. These elements are the s-block of the periodic table. The p-block, on the right, contains common non-metals such as chlorine and helium. The noble gases, in the column on the right, almost never react, since they have eight valence electrons, which makes it very stable. The halogens, directly to the left of the noble gases, readily gain electrons and react with metals. The s and p blocks make up the main-group elements, also known as representative elements. The d-block, which is the largest, consists of transition metals such as copper, iron, and gold. The f-block, on the bottom, contains rarer metals including uranium. Elements in the same Group or Family have the same configuration of valence electrons, making them behave in chemically similar ways. 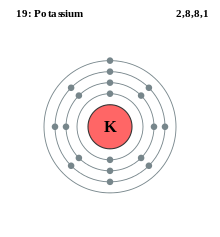 Potassium has many core electrons; the lone outer electron can easily be peeled off due to the "shielding" effect. There are certain phenomena that cause the periodic trends to occur. You must understand them before learning the trends. The effective nuclear charge is the amount of positive charge acting on an electron. It is the number of protons in the nucleus minus the number of electrons in between the nucleus and the electron in question. The nucleus attracts the electron, but other electrons in lower shells repel it (opposites attract, likes repel). The shielding (or screening) effect is similar to effective nuclear charge. The core electrons repel the valence electrons to some degree. The more electron shells there are (a new shell for each row in the periodic table), the greater the shielding effect is. Essentially, the core electrons shield the valence electrons from the positive charge of the nucleus. When two electrons are in the same shell, they will repel each other slightly. This effect is mostly canceled out due to the strong attraction to the nucleus, but it does cause electrons in the same shell to spread out a little bit. Lower shells experience this effect more because they are smaller and allow the electrons to interact more. , which is 1.6022 x 10-19 coulombs. You can see that doubling the distance would quarter the force. Most of the elements occur naturally on Earth. However, all elements beyond uranium (number 92) are called trans-uranium elements and never occur outside of a laboratory. Most of the elements occur as solids or gases at STP. STP is standard temperature and pressure, which is 0° C and 1 atmosphere of pressure. There are only two elements that occur as liquids at STP: mercury (Hg) and bromine (Br). Bismuth (Bi) is the last stable element on the chart. All elements after bismuth are radioactive and decay into more stable elements. Some elements before bismuth are radioactive, however. Leaving out the noble gases, atomic radii are larger on the left side of the periodic chart and are progressively smaller as you move to the right across the period. As you move down the group, radii increase. Atomic radii decrease along a period due to greater effective nuclear charge. Atomic radii increase down a group due to the shielding effect of the additional core electrons, and the presence of another electron shell. For nonmetals, ions are bigger than atoms, as the ions have extra electrons. For metals, it is the opposite. Extra electrons (negative ions, called anions) cause additional electron-electron repulsions, making them spread out farther. Fewer electrons (positive ions, called cations) cause fewer repulsions, allowing them to be closer. Ionization energy is also a periodic trend within the periodic table organization. Moving left to right within a period or upward within a group, the first ionization energy generally increases. As the atomic radius decreases, it becomes harder to remove an electron that is closer to a more positively charged nucleus. Ionization energy decreases going left across a period because there is a lower effective nuclear charge keeping the electrons attracted to the nucleus, so less energy is needed to pull one out. It decreases going down a group due to the shielding effect. Remember Coulomb's Law: as the distance between the nucleus and electrons increases, the force decreases at a quadratic rate. Periodic trend for ionization energy. Each period begins at a minimum for the alkali metals, and ends at a maximum for the noble gases. It is considered a measure of the tendency of an atom or ion to surrender an electron, or the strength of the electron binding; the greater the ionization energy, the more difficult it is to remove an electron. The ionization energy may be an indicator of the reactivity of an element. Elements with a low ionization energy tend to be reducing agents and form cations, which in turn combine with anions to form salts. Electron affinity is the energy released when an electron is added to an atom, producing a negative ion. Electron affinity is highest in the upper left, lowest on the bottom right. However, electron affinity is actually negative for the noble gasses. They already have a complete valence shell, so there is no room in their orbitals for another electron. Adding an electron would require creating a whole new shell, which takes energy instead of releasing it. Several other elements have extremely low electron affinities because they are already in a stable configuration, and adding an electron would decrease stability. Electron affinity occurs due to the same reasons as ionization energy. Electronegativity is how much an atom attracts electrons within a bond. It is measured on a scale with fluorine at 4.0 and francium at 0.7. Electronegativity decreases from upper right to lower left. Electronegativity decreases because of atomic radius, shielding effect, and effective nuclear charge in the same manner that ionization energy decreases. Metallic elements are shiny, usually gray or silver colored, and good conductors of heat and electricity. They are malleable (can be hammered into thin sheets), and ductile (can be stretched into wires). Some metals, like sodium, are soft and can be cut with a knife. Others, like iron, are very hard. Non-metallic atoms are dull, usually colorful or colorless, and poor conductors. They are brittle when solid, and many are gases at STP. Metals give away their valence electrons when bonding, whereas non-metals take electrons. The metals are towards the left and center of the periodic table—in the s-block, d-block, and f-block . Poor metals and metalloids (somewhat metal, somewhat non-metal) are in the lower left of the p-block. Non-metals are on the right of the table. Metallic character increases from right to left and top to bottom. Non-metallic character is just the opposite. This is because of the other trends: ionization energy, electron affinity, and electronegativity.